We have some special guests in the house. In addition to our loyal Login readers, today's newsletter is also going to members of MIT's Solve conference community. Please make the newbies feel welcome. 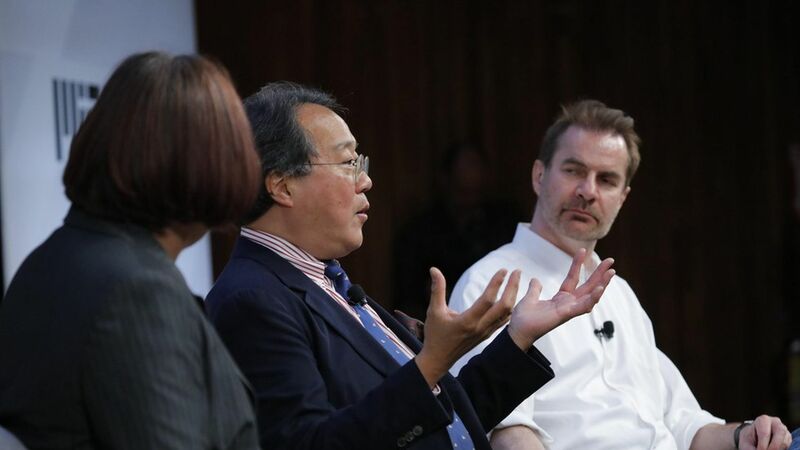 When MIT first asked me to moderate a session that included Yo-Yo Ma and former defense secretary Ash Carter, along with an economics professor and an Indian biotech entrepreneur, I wondered how on earth to tie everything together. But the key was the question MIT asked four speakers at the Solve conference: Does technology still create more opportunity than it destroys? It really is one of the defining questions of our era and one that must be answered by society as a whole, not just those who create technology, so having such a diverse group discuss the topic really makes sense. Whenever there is something new that is invented, it goes through lots of bumps. In order to figure out what the human condition will do. Is it bad? Is it good? It's not the technology that we need to worry about. It's us. How well do we understand ourselves? I'm 61, I'm still trying to figure it out. That's not about machines. We need to figure out what we're here for. Of course, it's great that we have robots, but the robots are not humans. They can do all these things, but they don't wonder. They don't necessarily suffer. I view this as the biggest question for our society over the coming decade, the role of technology and the way it is going to reshape the economy and jobs. It's already having a huge effect. There's a lot of hype around it as well... We're not facing the end of work. It's not that robots are going to take all the jobs any time soon. Think about your responsibilities as an innovator... It's not a birthright that technology does only good things or only bad things. That's a choice that we make. Historically the [impact] has been overwhelmingly positive. We forget about the under-resourced, under-skilled developing world. What we are looking for is technology to bridge a lot of these deficits. If you think about a country like India, India is very excited about a digital world. Just take for example Uber and its Indian counterpart, Ola. They've created a million jobs just because India today has 650 million mobile phones which have suddenly allowed people to have service on demand, which was never possible before. You couldn't even hail a taxi in most parts of the country. We look at technology as a huge job multiplier. The discussion will continue over the next two days, with speakers to include Xerox chairman Ursula Burns and former U.S. CTO Megan Smith. Zuckerberg ate dinner with an unsuspecting Ohio family who didn't know Zuckerberg was their mystery guest until 15 minutes before he showed up. Business Insider reported that the CEO's staff set up catering for the dinner and told Zuckerberg's host that he wouldn't want to be seated at the head of the table.He visited a farm where he fed a calf and drove a tractor for the first time.He met with people affected by the opioid epidemic in private, even though such "listening tour" events are a classic way for politicians and executives to talk about an issue in front of the press.The upshot: Even if he doesn't run for public office, the tour is helping boost his ability to handle a wide range of situations. Former Jeb Bush communications director Tim Miller told us "whether you're an executive or politician and you're put in these awkward staged situations where you have to have a discussion with regular people — if you don't have a lot of practice doing that, the result is awkward." When you have to replace your cards: We've all been there. You lose your wallet and then you have to call the credit card companies and wait for new cards to arrive. Even if they overnight them it can be a hassle. But, with Apple Pay, some magic happens. As soon as you report the card missing, your phone can be updated with the new card. My partner left his wallet on a plane, but as he cancelled the cards, the replacements showed up on my phone, while he had to wait for the physical counterpart to arrive in the mail. When you forget your wallet at home: This happened to me yesterday as I was jet-lagged from taking the red eye to Boston. Relying on Apple Pay limits your options (only a couple of the quick-serve restaurants in the food court accepted Apple Pay). But at least you have some options. Plus, the main reason I went to the mall was to get my make-up done for Solve, and Sephora takes Apple Pay. John Oliver has managed to do what dozens of public interest groups have struggled to do: Rally the public around the potential rollback of net neutrality rules. So far the FCC has received almost 150,000 comments (though not all take Oliver's position) since his piece aired on Sunday. And that's despite claims of a denial-of-service attack. It's been more than two months since Alphabet's self-driving car unit, Waymo, accused Uber of stealing and using its trade secrets, and it can be tough to keep track of everything happening. Luckily, Kia has updated her timeline of the case to reflect the new developments that came out last week as a federal judge heard arguments from both parties on whether he should grant an injunction halting some of Uber's self-driving car efforts (a ruling on that is due soon). Among the new details added to the timeline are: the stock grant that Uber gave Anthony Levandowski, effective two days after he left Google, and, the December 2015 internal Uber emails that show that it was considering acquiring Levandowski's yet-to-be-formed startup before he had even left Waymo. What's at stake: Should the judge rule in Waymo's favor, Uber could find its autonomous driving program in jeopardy — a potentially expensive setback for the ride-hailing company. While Uber's present is all about matching drivers and riders, the company's future economics look a whole lot better if it can take drivers out of the equation. On tap: MIT's Solve continues in Boston through Wednesday (sign up here for updates from the Solve team)...Nvidia reports earnings after the bell Tuesday. Trading places: Stripe has hired noted security researcher Peiter "Mudge" Zatko as its new head of security. ICYMI: Comcast and Charter confirmed they are exploring ways to work together on wireless service...Pandora has raised $150 million from KKR, but is also considering selling itself. Also of note, 70 percent of its members are into country music...Amazon may introduce a touchscreen version of its Echo speaker as early as today. Is all this talk of Boston making you hungry for some clam chowder or baked beans? Here are some recipes. We'll be back tomorrow with more from MIT's Solve conference and the rest of the world in tech.